From utility wares to aesthetically pleasing sculptures, traditional Japanese ceramics, known as yakimono (焼き物, literally "fired thing" or "burned thing") has remained one of the country's oldest art forms. Traditional ceramics are found everywhere in Japanese culture: tea ceremony enthusiasts and flower arranging masters, among others, often skillfully choose pieces that demonstrate not only basic utility, but also profound beauty. Exploring the history and aesthetics of pottery is a great way to develop a deeper understanding of Japanese culture. With a heightened sensitivity to its presence, you will begin to notice how these resilient objects add an element of aesthetic context to the substances that they hold. Join us as we take you on a brief journey through the history and evolution of yakimono, where we hope you will discover an ancient world of art and function that goes far beyond superficial beauty. Known as one of the oldest earthenware traditions in the world, the yakimono tradition began around at least 12,000 years ago during the Jōmon Period (縄文時代), the time of hunter-gatherer culture in prehistoric Japan. 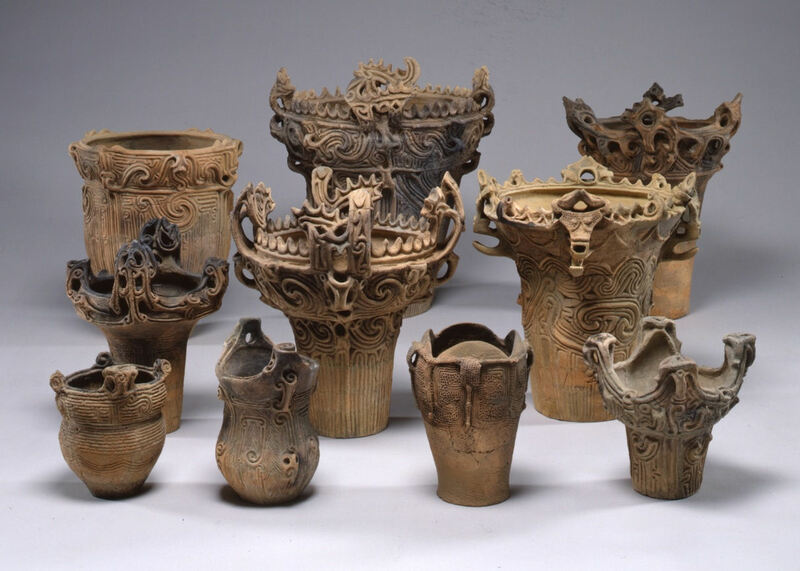 Pieces created during this time period are identified with the name “Jōmon,” meaning "cord-marked" or "cord-patterned," because of the way pottery was decorated by impressing cords onto the surface of jars or containers. But the Jōmon style was just the beginning of something much more complex and varied. Since its early beginnings, Japanese ceramics has evolved considerably over the centuries, having been significantly influenced by neighboring countries and cultures. techniques with the varied chemical composition of the clay in each region that we have the plethora of unique yakimono styles that exist today. Raku IX Tea Bowl made with aged pine with Crane Design (1810-1838). According to Tokyo-based Japanese ceramist Masahiro Maeda, there is no country that has a more profound appreciation for the art of pottery than Japan. This is thanks to chadō, or the art of the tea ceremony. In other words, tea bowls play a leading role in the chadō performance. In the 16th century, ceramic tea cups began to attain a high aesthetic value. In tandem with the wide practice of the tea ceremony, the iconic ceramic style of wabi-sabi emerged. Wabi-sabi, a concept derived from Buddhist teachings, represents the Japanese appreciation for all things natural, imperfect, impermanent, aging, and incomplete. Popularized by the renowned Japanese tea masters of the period, artisans began to mold tea bowls according to wabi-sabi aesthetics. Today, we refer to them as juraku ware, or simply raku ware. Still celebrated to this day at traditional tea ceremonies, the host or the teahouse master will often present the guests with his or her rich collection of tea bowls. During the 20th century, Japan underwent a rapid period of urbanization and industrialization in the wake of the Second World War. Unfortunately during this critical time period, there was a steep decline in the popularity of yakimono. In the period of only one generation, Japan’s pottery heritage almost entirely disappeared. True—Japanese ceramics and porcelain production was considered an elite yet traditional art. But during the Edo and Meiji eras, a government-led Westernization of Japan led to the decline of many traditional practices, and pottery creators and pottery consumers alike were not spared. However, all was not lost . . . The Mingei (民芸, or literally “folk”) movement, started in 1926 by philosopher-critic Yanagi Sōetsu, almost single-handedly saved yakimono and other important traditional crafts from being lost forever. Soetsu and a group of entrepreneurial potters wanted to revive an interest in Japanese ceramics by demonstrating that even “humble goods could be inherently beautiful.” Aware of the rapid modernization that was occurring simultaneously, mingei artists found ingenious ways of asserting traditional Japanese identity without disavowing all of the important changes that were happening in society at the time. For example, by hosting elaborate collections and encouraging the newly rich urban middle class to embrace yakimono, proponents of the movement became essential in helping to preserve and elevate the standards of Japanese ceramics to the haute status that it has in the art world today. The word yakimono does not just refer to pottery, but is an important term that encompasses the entire ceramic culture of Japan, including porcelain and earthenware. Naturally, connoisseurs of Japanese ceramics have their own vocabulary much the same way that erudite wine-lovers and sophisticated coffee bean fanatics employ specific lingo to talk about their passions. Generally, Japanese ceramic wares can be largely divided into four categories: earthenware, stoneware, "pottery," and porcelain. Earthenware (doki): Usually fired at 700 to 800°C (1292-1472°F). No glaze. Not waterproof; porous; opaque. Stoneware (sekki): Made from clay with alkali or iron, fired at 1200 to 1300°C (2192-2372°F) over a long period; waterproof; opaque. Pottery (tōki): Glazed clay surface fired around 1200°C. The clay surface (when not glazed) is not waterproof and is opaque. Porcelain (jiki): White surface, low permeability; known for translucence, thin, but also known for strength and hardness compared to tōki. As mentioned earlier, the styles vary significantly from region-to-region. Four well-known regional varieties include Mashiko ware, Kutani ware, Arita ware and Mino ware. 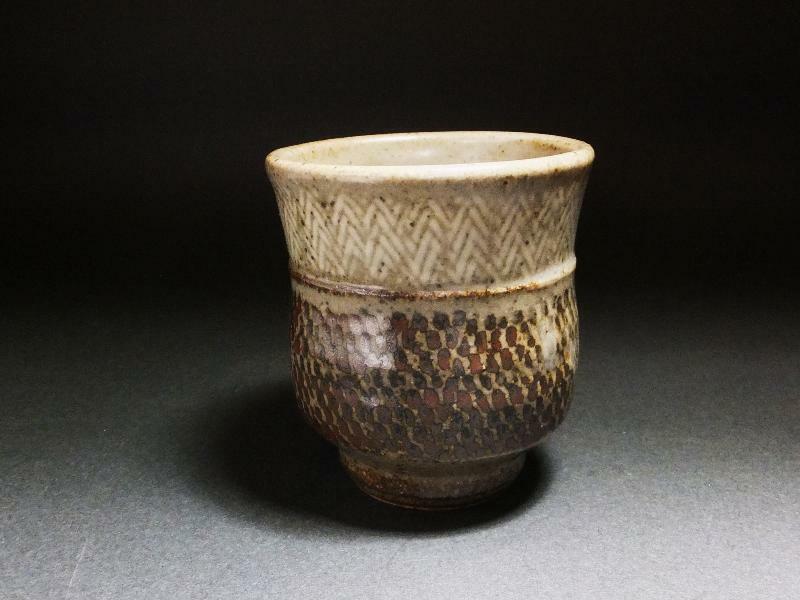 Mashiko ware: Glazed stoneware from Mashiko City, located in Tochigi Prefecture. Often thick and rustic, it's known for its simple designs. Famous artists include: Shoji Hamada and Tatsuzō Shimaoka. Kutani ware: This is fine porcelain from Ishikawa Prefecture. Potters from this region are known for their use of five colors: red, green, purple, yellow, and blue. Famous artists include: Isokichi Asakura and Minori Yoshida. 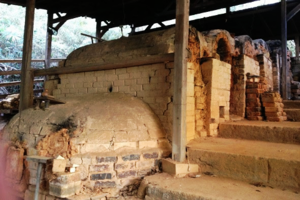 While the number of ceramic artists is decreasing around the world, Japanese kilns continue to stand strong to this day. Walk into almost any traditional Japanese restaurant, izakaya bar, yakitori restaurant, or sushi bar, and you'll find your table adorned with small ceramic plates, a soy sauce dish, ceramic cups for your sake, beautiful teacups, and even hashioki (chopstick rest) in a rainbow of colors and designs. At your next Japanese dining experience, take a moment to observe how your ceramic dish ware comes alive when filled with a cup of hot tea or chilled sashimi. Particularly popular today are mamezara (豆皿), or "small dishes," which come in all kinds of shapes and sizes (Mt. Fuji is a popular choice!). These dishes, which are usually not larger than a child's hand, have been widely produced since the 17th century. Both visitors and tourists alike love to purchase these types of yakimono because they make wonderful souvenirs. Today, there is no place better than in Japan to enjoy such an impressive variety of extraordinary ceramic art. In Tokyo alone there are numerous ceramic art shows, certainly more than in many other major international art hubs. Within the past decade, there has been an exponential rise in overseas interest from private collectors and institutions, with some pieces selling for hundreds of thousands of dollars and entire collections selling for millions at prestigious auction houses. Yakimono remains a vital and exciting form of Japanese art. In Japan, there are many successful, thriving potters who are able to make a living off of their art. Historical and regional traditions of ceramic production continue to flourish and talented artisans continue to maintain a high degree of artistry, which is at the same time very traditional yet very modern. When one thinks of high Japanese art or aesthetics, pottery or ceramics may not be the first thing that comes to mind, but perhaps it should be; it is as ubiquitous in Japanese society as rice or the changing seasons. Through a personalized pottery experience, enjoy the hospitality of a traditional Japanese tea ceremony utilizing the art work. Learn authentic ceramics techniques from one of Japan's most premier pottery artists today.